Right now in the world, there is a spiritual evolution occurring. More people are opening up their minds to alternative teachings and questioning the religious beliefs and doctrines that were passed down from generation to generation. Many Christians believe that we are in the “end-times” and that Christ return is imminent. We constantly see earthquakes, famine, and war on the news. Is this a unique time in history or are we just paying closer attention? These natural disasters have always been taking place, but at this time in history, we are much more sensitive to them. There are hundreds of books written to inspire this teaching such as the Left Behind series which focuses on the fact that one day all of Christ's followers will be taken off earth physically—known as the rapture—and will disappear, while the others are left behind to survive on earth. Are we in the Age that Jesus talked about signaling his return? There are many different views and beliefs about the spiritual crisis that is occurring within humanity at this time. People are evolving, shifting, and opening up their minds. Christians are starting to question things more and are trying to make sense of the destruction in the world and the loss in their own families. More Christians are having unexplained psychic experiences that they can’t explain with their religious beliefs. People are suffering and are seeking answers to their personal experiences and many are turning to the “new age” philosophies for answers. Medical technology is failing and the medical care that we are receiving is often not healing us, but making us sicker. Many people are seeking alternative therapies such as seeing chiropractors, massage therapists, acupuncture specialists, energy healers, and new age practitioners to treat their health conditions. This is a time of questioning, exploring knowledge, increasing our spiritual awareness and focusing on technological advances to help humanity survive in these trying times. Some believe that we are in the “Age of Aquarius” and there are many different opinions as to when this age actually starts. It is evident that we are in an intense energetic time and we are all feeling it, but what is it that we are feeling? We are experiencing the energetic shift of humanity and the transformation of consciousness. We are moving into the Age of Aquarius. In the Bible, it states, “These things happened to them as examples and were written down as warnings for us, on whom the fulfillment of the Ages has come” (1 Cor. 10:11). We can no longer think or live as we have been. Humanity needs to make changes to ensure its survival. We've all heard of global warming now and each day the weather is so chaotic that we don’t know what we are going to experience. One day it snows and the next it is extremely hot and weather anomalies are happening all over the world. Is this the end of the world or just a preparation for something much bigger than us? Jesus talked in the Bible about the changes in the future that would signal his return. He said that there would be “Signs in the Sun, Moon, and stars” (Luke 21:25) signaling his return. Aquarius rules astrology so maybe astrology will be taken more seriously by the masses during this new age. None of us can deny that he discussed earthquakes, famine, weather changes, and disasters. These things have been going on for decades since Christ so what makes now so important? Why are people so afraid that the end is near? Astrologers denote an astrological age occurs approximately 2,150 years on average. There are many different ways of calculating it and many different theories. Some astrologers believe that ages affect mankind while others believe the ages correlate to the rise and fall of mighty civilizations and show cultural tendencies. It is believed that Jesus and Christianity started the Age of Pisces. Pisces astrological symbol is the fishes, and the fish is associated with the Christian faith and was used secretly by them to identify themselves. Jesus was the “Fisher of Men” and was known to talk symbolically about fish. Pisces traditionally rules spirituality, compassion, sacrifice, service to others, and faith. All these things were strong during the Piscean Age, and it was a time when one of the largest religion’s of the world was started. If we are moving into the Aquarian Age, it is often associated with the “New Age” as Aquarius rules all things non-traditional, non-conforming, rebellious, questioning, technological, and scientific. Aquarius rules electricity, computers, airplanes, flight, democracy, humanitarian efforts, and astrology. Some astrologers believe that the New Age is experienced before the Aquarian Age arrives because of a cuspal effect or Orb of Influence. Other astrologers believe the appearance of Aquarian developments indicate the actual arrival of the Age of Aquarius and believe that we are currently experiencing it. Jesus was the one who announced the Age of Aquarius and said, “A man will meet you carrying an earthen pitcher of water; follow him into the house where he goes in” Luke 22:10. 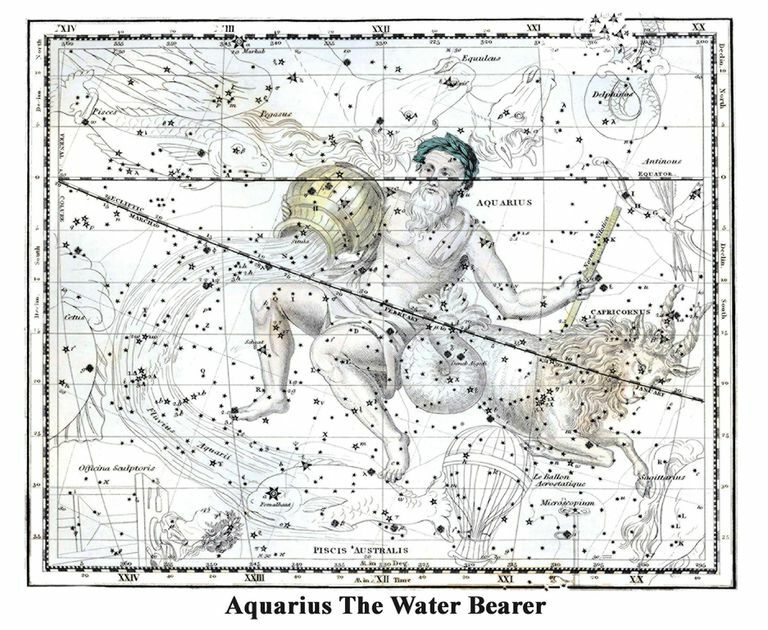 Since ancient times Aquarius was called the “water-bearer” and is symbolized by the Face of a Man in the Book of Revelation as one of the fixed signs of the zodiac. Aquarius is symbolized by a man carrying a jug of water and this symbol existed since ancient times. It's interesting that Jesus tells us to “follow the water-bearer.” Jesus was telling his followers to follow the Aquarian Age and enter the house he goes in, which can mean he was helping us prepare for the future by telling us to follow this new spiritual expansion and rebirth. Jesus was educating the disciples and warning them about this crucial time in human history and preparing them for it in advance. The Age of Aquarius is all about enlightenment and represents spirituality coming together with science. It is a time in history where religion and science need to unite and create better medical innovations and medical technologies to help humanity. It is a time where we can use science to help validate religion and God instead of fighting over the “creation theory.” There are so many books that are written now by scientists, such as What the Bleep Do We Know, that proves that there is a soul inhabiting the body. There is research that our thoughts are powerful and can cause illness in the physical body, and a lot of research is being done to show the connection of emotions, meditation, and prayer on healing and physical ailments. These things are the blessings of the Aquarian Age. Esoteric Christians such as the Rosicrucians believe that the Age of Aquarius will bring human beings into real knowledge and discovery of the deeper Christian teachings which Christ spoke about in Matthew and Luke. In the Aquarian Age, they believe that it is expected that a great spiritual teacher will come and will give the Christian religion a push in a new direction. They talk about the Christ Consciousness which will be awakened within human beings and they will realize their oneness with Christ teachings. For many people, today this is a time of questioning and people feel a sense of foreboding. The anxiety that many of us feel is related to the energy of change. Change is hard for human beings and it takes us time to adjust. There have been so many technological and spiritual changes in the world. These changes took place at an alarming rate. The Aquarian Age is dawning upon us or we are already in it. Either way, this is a time for all of us to start to question our beliefs and open our minds to the teachings of Christ and the great religions. It is a time to come together as a society and help each other instead of focusing on who is right and wrong and which religion is true or false. It is a time to live the teachings that Christ taught. As he said, “take up your cross and follow me.” Christ did not want us to merely argue our beliefs, he wanted us to “walk the way” and be like him. He wanted us to live the life he taught, which was forgiveness, loving our fellow man, accepting others regardless of their material situation and working together in peace. That is what the Aquarian Age is all about. We should all continue to embrace this Aquarian energy and not just merely accept what we are told, but to question and to truly look at the teachings of Christ from all different perspectives. What's the Dark Side of Aquarius? What Are Mercury Aquarius People Like? Why is Astrology Considered an Occult Art? Neptune—What's the Meaning in Astrology? Are Virgo and Aquarius the Odd Couple? Taurus and Aquarius: Will This Relationship Last? Do Leo and Aquarius Make a Social Love Match? Are Gemini and Aquarius Compatible?